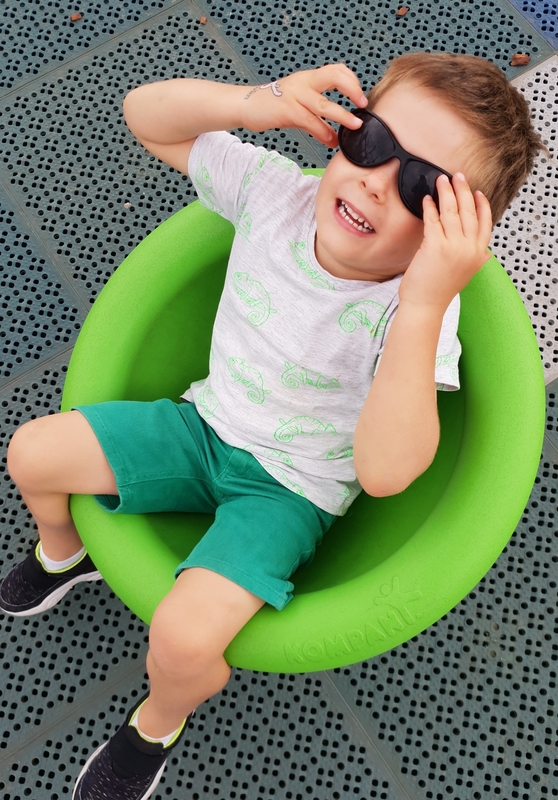 As a mum of three very active children (that's the polite way of saying it), when I hear of a café/playground combo, I am all ears. Why? Because I get to sit and eat whilst the children are entertained and active - what's not to love? My favourite café/playground combo just got a whole lot more exciting because the playground in question has undergone a fabulous makeover. Unless you've been hiding under a rock for a long time you will no doubt have heard of, if not visited, the North Point Café in Brighton. It's spectacular position right by the beach and it's tasty tucker are a big draw-card in the Bayside area. After a bite to eat, one can wander along the seafront or go down onto the beach itself. The views to the city are stunning. 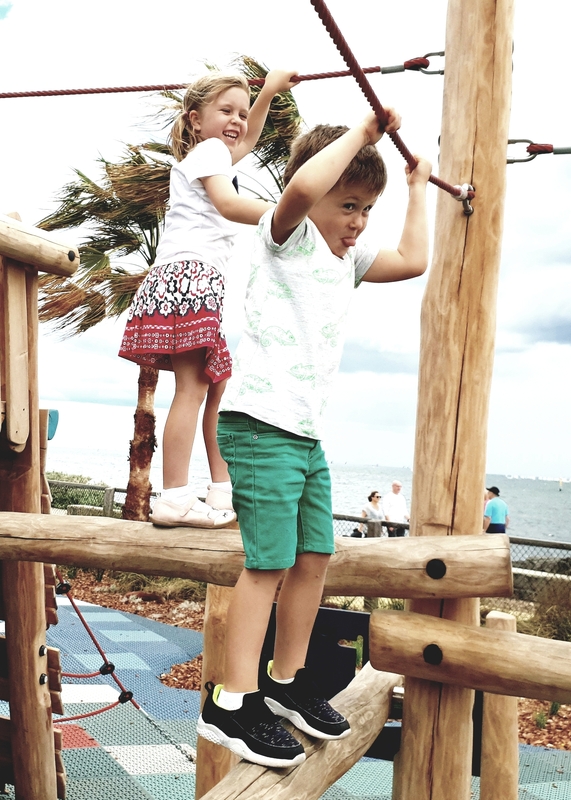 What you might not know if you haven't visited recently is that the playground opposite the café, officially known as the North Road Foreshore Playground, has been revamped and it's a great little spot for all the climbers out there. The design of the new playground has drawn upon the quirkiness of the original but improved it on so many levels. There are plenty of climbing options for active kids. 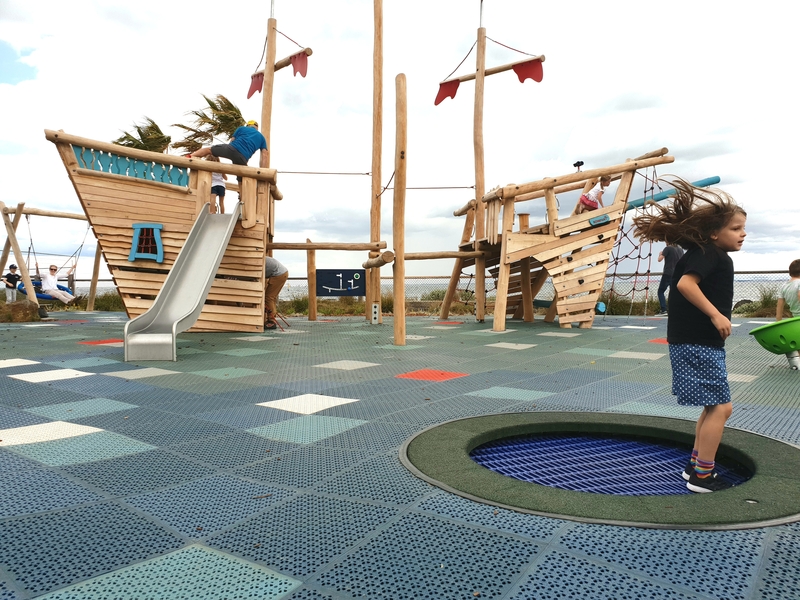 The main boat structure - which the original park was all about - has been re-imagined and offers the perfect mix of imaginative play (think pirates, sharks, mermaids and storms) and physical elements. 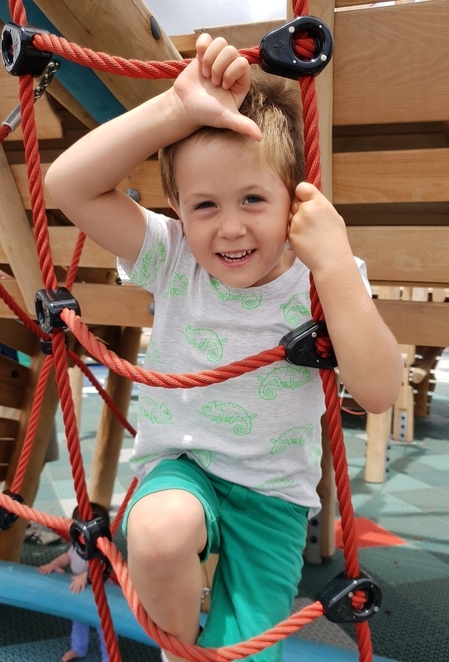 There are numerous ropes, nets, slides and hidey holes to explore, all surrounded by a very safe, squishy surface should anyone have the misfortune to have to walk the plank. Little ones will love the spinners. Besides this feature piece there are plenty of other surprises including mini in-ground trampolines, individual spinners which will leave you green just looking at them, and a large birds nest swing. The little ones haven't been forgotten with a beautiful sand and water play area just begging for some attention. There are water pumps just right for little hands and a change of clothes is recommended as messy play is the order of the day here. This playground has become one of our favourites! 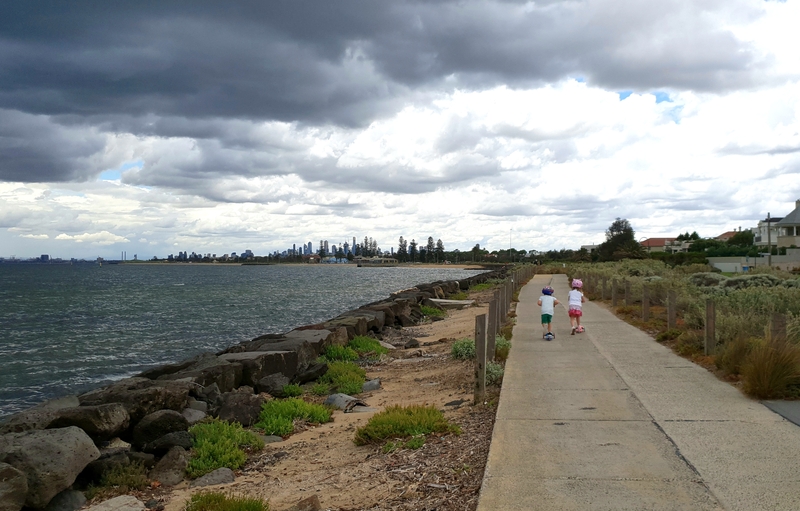 If all that playing doesn't tire out your little tykes, take advantage of the bike track or walking track alongside the beach and stretch their legs even further. There's often an ice-cream van a little way down the track (walking north), so be prepared to part with some cash. This little adventure is one that definitely should not be missed.